Mimi's spread is done. Finally. Late, but it's finished. I had posted my sneak peek's at flickr, but got Mimi's permission to post the entire spread. Mimi's theme for her book is identity. Check out her beautiful pages here. My first thought was to come up with some adjectives on how I would describe my dear friend. There was quite an extensive list but I settled on these seven. Next, I chose one of those adjectives and worked the rest of the spread with that theme in mind. I decided on "gardener" because one of interests Mimi and I share is a love of gardening. When we met last summer we even talked about composting. I couldn't believe it! A fellow city deweller who composts. A rare find (where I live anyway). Read through Mimi's archives and you will find beautiful photos of her garden. 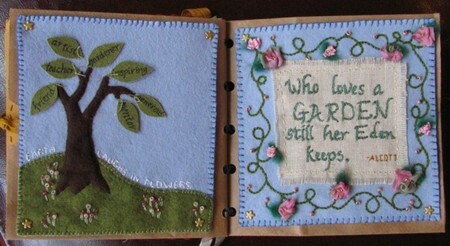 Then I picked two of my favorite quotes to stitch into her book. The first is by Ralph Waldo Emerson (sadly I didn't have room to add his name). 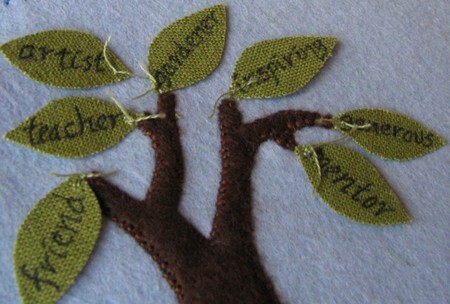 The next quote is by Alcott, and I changed it slightly making the "his Eden" to "her Eden". Here in full are the two pages. 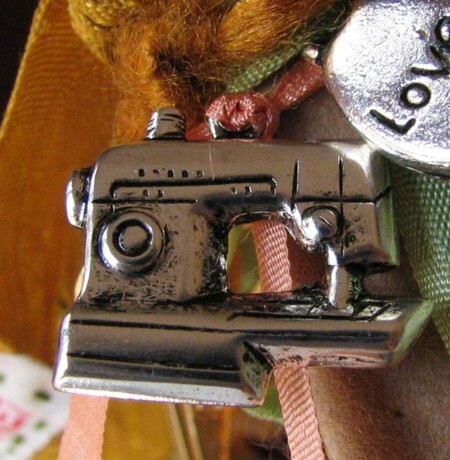 Also, I thought she needed a sewing machine to go with her scissors, so added this to her binding. Finally, to complete the book, we fill one of the pages with lots of fun stuff. I searched high and low for anything that made me think of Mimi. Most of it has flowers on it. 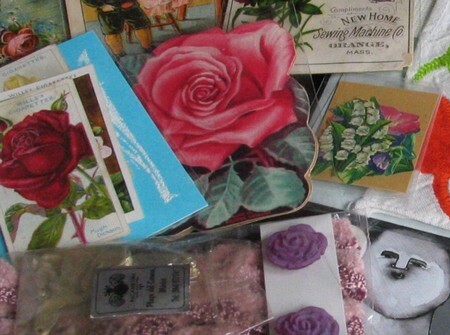 And I thought I had remembered reading in one of her posts, she was looking for those little vintage cigarette labels. Happily I was able to find some. Here is a peek at some of the swag that went into her book. Next up is Theresa's book which I received in a timely fashion from Mimi. I need to squash that inner critic, because when I saw the beautiful spread she had done, I wanted to start my piece for her all over again. I love her style so much! I'm trying very hard to loosen up my stitch work, but it seems this is the way I work best. On another note....thank you all so much for the beautiful comments you left on the previous post. I was deeply touched by what you wrote there. I'm still amazed at how many friendships have developed though this site, and I'm grateful for each and every one.